The wacky fun continues as a young boy awakens to find a half-head of hair. After chugging down his glass of milk that's two-thirds gooey paste, he and his friend are off to camp for a day of fraction fun and an out-of-this world soccer game. 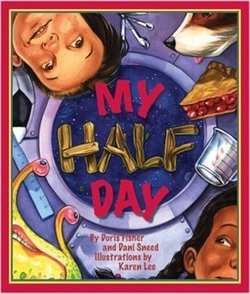 Doris Fisher’s ‘My Half Day’ (2008) follows the story of a boy who wakes up to find a half-head of hair. The story does a good job in highlighting everyday life scenarios where fractions can be found. Presented in rhymes, the story shows a creative way in which mathematics and language can be further integrated. However, a question can be raised on the extent to which the poetic structure may limit the story’s ability to sufficiently explain to its young readers what fractions are. Unfortunately, several page illustrations contain ambiguous visual representation of fractions. For example, early on in the story, the protagonist is shown holding what appears to be a half-full glass of milk with ‘two-thirds gooey paste’, but there is nothing to indicate the ‘two-thirds’-ness. Similarly, another page illustration showing a soccer referee explaining that each goal counts five-eighths, while she is holding ten fingers. Another page illustration describes how children are sitting by a campfire on three-tenths of a log, but a quick glance at the illustration seems to show the children sitting on half of the log. Another illustration features an image of the moon with ‘1/6’ featured on it, but the said fraction bears no connection to the text on that page, and there is nothing to indicate anything 1/6 about the moon. On that same page, the text says the characters can see two-thirds of a comet, but the accompanying illustration of the comet shows the comet in full view. Sadly, there are more examples of this nature in the book. The story misses a great opportunity to help its young readers to make meaningful connections between different modes of mathematical representation. For example, every time a fraction is mentioned (e.g. 'five-eighths'), a corresponding mathematical model (e.g. a circle with five-eighths of its sections being shaded) and a corresponding symbolic representation (e.g. 5/8) could have been displayed at the bottom of each page, so meaningful connections can be made between mathematical language, models and symbols. ​In terms of diversity: while the characters are sufficiently diverse, the protagonist is a white boy. We would have loved to see his friend, Donna, an ethnic minority girl, to have a slightly more central role. ​In summary, the story helps to introduce some fraction names, and has the potential to be a useful mathematical teaching and learning resource - when used with caution. Suitable for children aged 6+ years old.